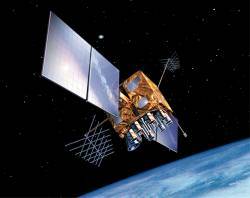 Civil GPS users now have a second full signal available to them — albeit on only one satellite and “at the user’s own risk” — courtesy of the first modernized Block IIR (IIR- 14M) spacecraft launched last September. And the world’s geodetic community is already moving to take advantage of it with announcement of an addendum to the receiver autonomous exchange (RINEX) format used to combine high-precision position data from different types of GPS receivers. The GPS Operations Center at Schriever Air Force Base announced availability of the L2C in a December 16 Notice Advisory to Navstar Users (NANU). The signal is transmitted at the GPS L2 frequency centered at 1227.60 MHz. Satellite IIR-14M, placed into the orbital plane/slot C4, is also known by its space vehicle and pseudorandom noise code numbers: SVN53/PRN17. Military users will have additional access to two versions of the new military M-code, one at L2 and the other at L1 (centered at 1575.42 MHz). Meanwhile, on January 11 Prof. Dr. Werner Gurtner, head of the satellite laser ranging department at the Astronomical Institute of the University of Berne, Switzerland, announced definition of a new C2 code in the RINEX format widely used by geodesists and incorporated by manufacturers into numerous high-precision GPS receivers. Gurtner is one of the originators of the RINEX format introduced more than 16 years ago. The definition is included in Version 2.11 of the format, which also includes clarifications to the RINEX geostationary satellite-based augmentation (SBAS GEO) Navigation Message file. These introduce four new observables into the Met Data Files (wind speed and direction, rain, and hail indicator) and define codes for the Galileo System (E), Galileo System Time (GAL) and frequency numbers for the various Galileo frequency bands, L5 for GPS, and SBAS. Version 2.11 also contains file names for high-rate tracking data recommended by the International GNSS Service (IGS). Documentation is available at the IGS ftp server <ftp://igscb.jpl.nasa.gov/igscb/ data/format/rinex211.txt>. In its Dec. 16 NANU, the U.S. Air Force emphasized that it would not guarantee the availability or quality of L2C signals until initial operational capability (IOC) — or the broadcast of the signal on at least 21 satellites. Some GPS manufacturers have already begun producing receivers capable of processing the L2C signal. Among these are the Trimble R7 and R8 receivers, Septentrio’s PolaRx2C, NovAtel’s OEMV family, the Topcon Paradign G3 chipset and equivalent Javad Navigation Systems GeNiuSS chip. In addition to these varieties of user equipment, Spirent Communications’ GSS7700 hardware simulation system can also generate L2C signals.